Most everyone knows it is easier to get a job when you have a job. Employers are inclined to suspect that there may be something wrong with an executive who has been downsized. The reason? Companies often use downsizing as a way to rid themselves of underperforming employees. However, while it has always been hard for someone who is unemployed to get a new job, it has never been harder than it is today. MSNBC host Rachel Maddow recently noted that people who are unemployed are staying unemployed for an average of 40 weeks — the highest level ever since the Bureau of Labor Statistics started keeping track. 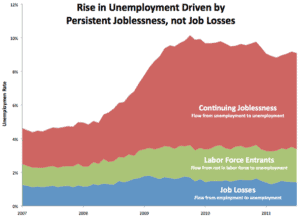 Former Chief Economist and Economic Advisor to Vice President Joe Biden Jared Bernstein recently published a chart on his blog that breaks unemployment into three groups. There are the recently downsized, the new entrants to the job market, and then there’s everyone else mired in continued unemployment. As leaders in Washington grapple with job stimulus programs, the biggest problem that needs solving is that of not being able to get a job unless you have a job — a classic catch-22. We at The Good Search and at our recruiting research division Intellerati regularly hear from strong candidates who through a perfect storm of events have found themselves unemployed longer than they — or anyone really — thought possible. Author Joseph Heller first coined the term in a historical novel by the same name. His satire on bureaucratic think and circular logic resonated so deeply that “catch-22” has since come to mean any “no-win situation”. Until we solve the catch-22 of persistent unemployment, nobody wins. Our recovery will remain elusive as Major Major’s sanity.